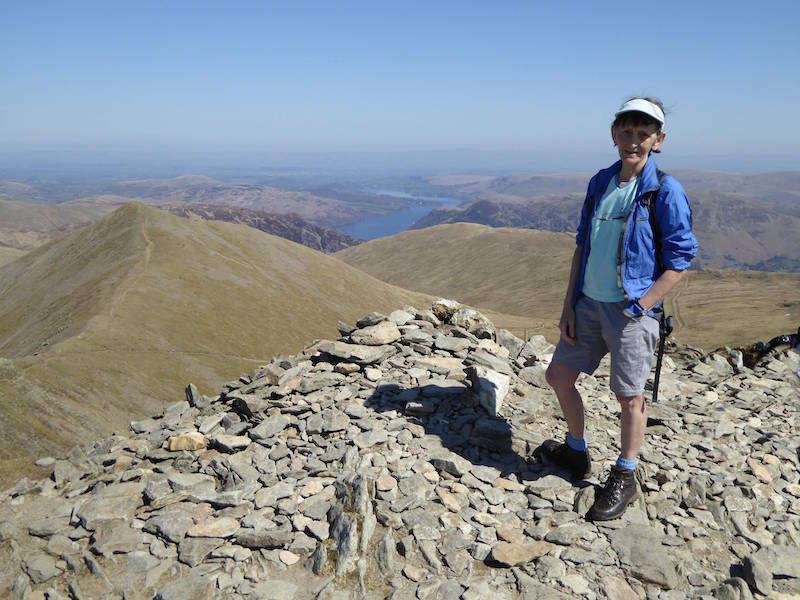 A fine day was forecast so it was on with the shorts and over to Dunmail Raise where our walk will start. 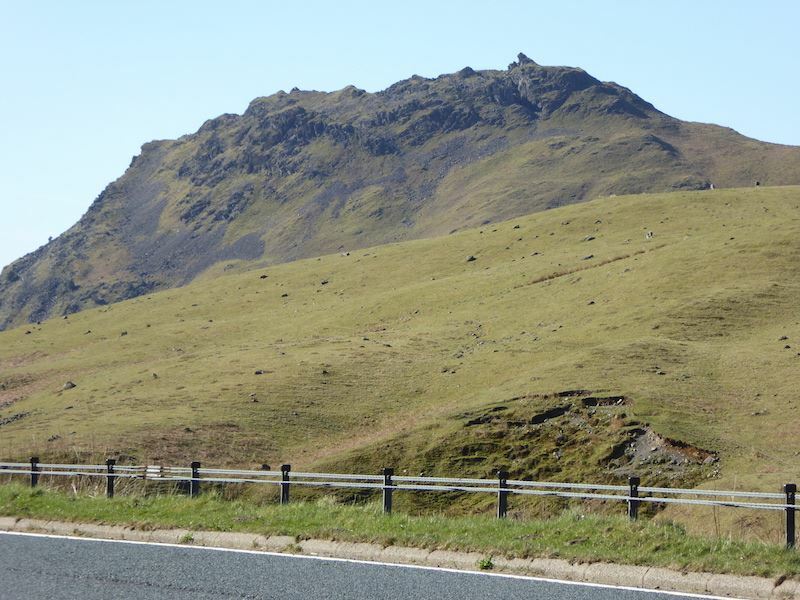 Here’s a view of Helm Crag from the lay-by. 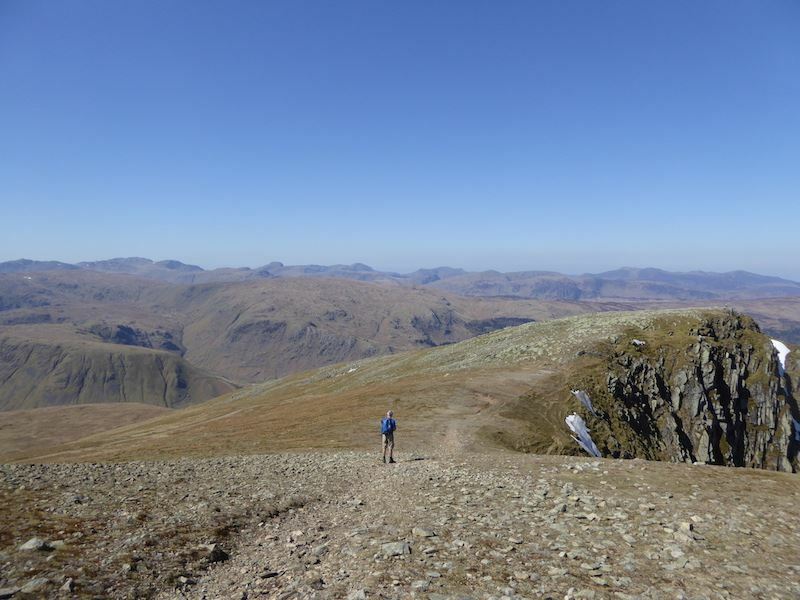 We haven’t been up there for a while now, it just seems to be one of those fells that we’re always going to visit and yet never seem to get around to. 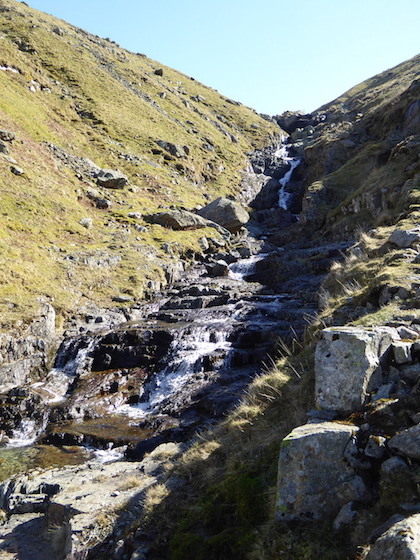 Looking up Raise Beck, which is our starting point today. 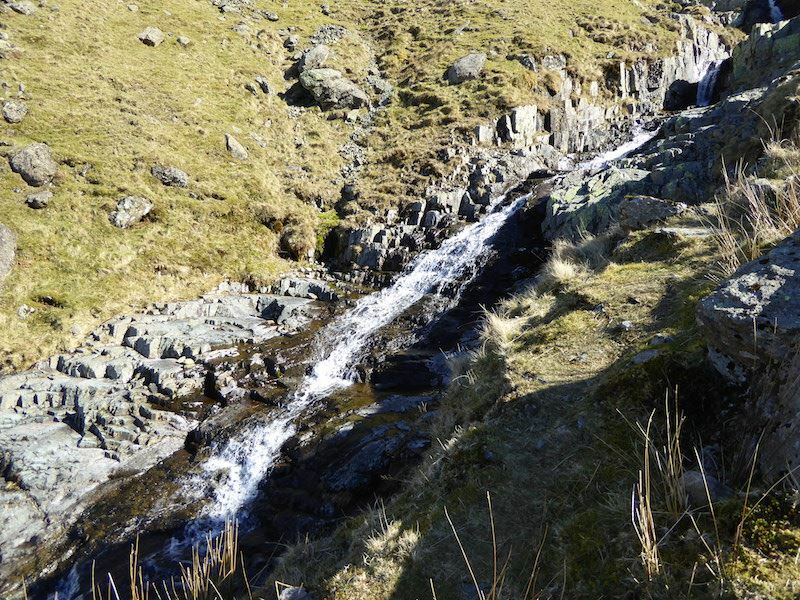 I know it doesn’t look like it but there is a path up there alongside the beck. I always enjoy this route, its not an endless and dreary uphill slog, there are rocky sections to scramble over here and there, and of course the cascades and waterfalls keep the interest going and the camera shutter clicking. 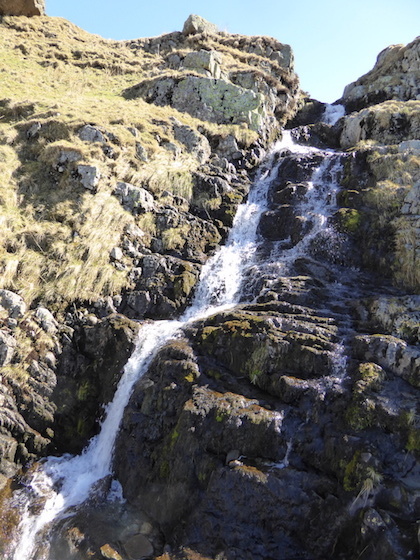 Raise Beck has a series of lovely cascades and the next few photos show some of them ….. 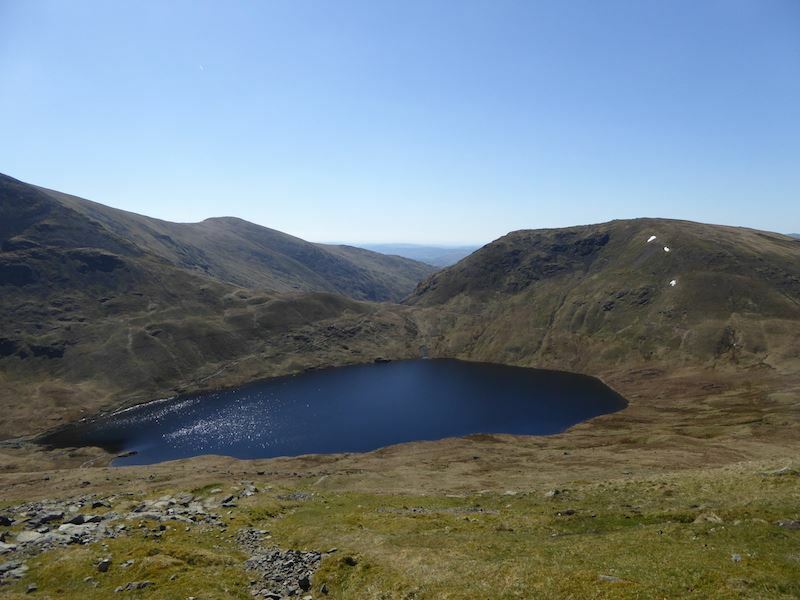 When you reach the top of the beck a little way further on is Grisedale Tarn, and here’s the tarn with Fairfield behind it. 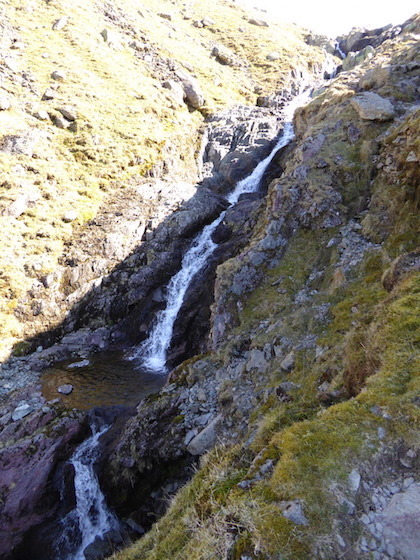 We met another walker along here who mentioned that it was his first walk of the season and hadn’t expected it to be this warm, so he was rummaging in his pack to find his shorts which he’d packed, just in case. 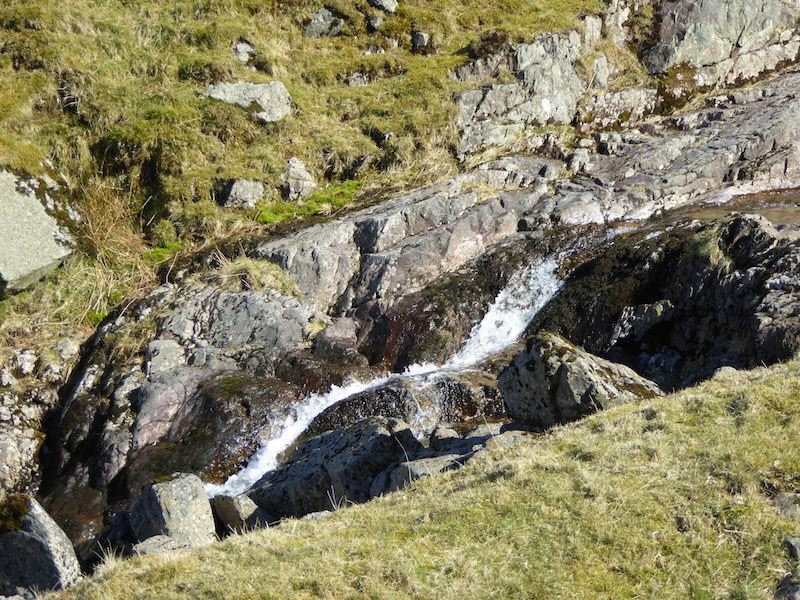 We carried on knowing that he wouldn’t want an audience while he was getting changed, and from this point we walked alongside the tarn to reach the path which leads up to Dollywaggon Pike. 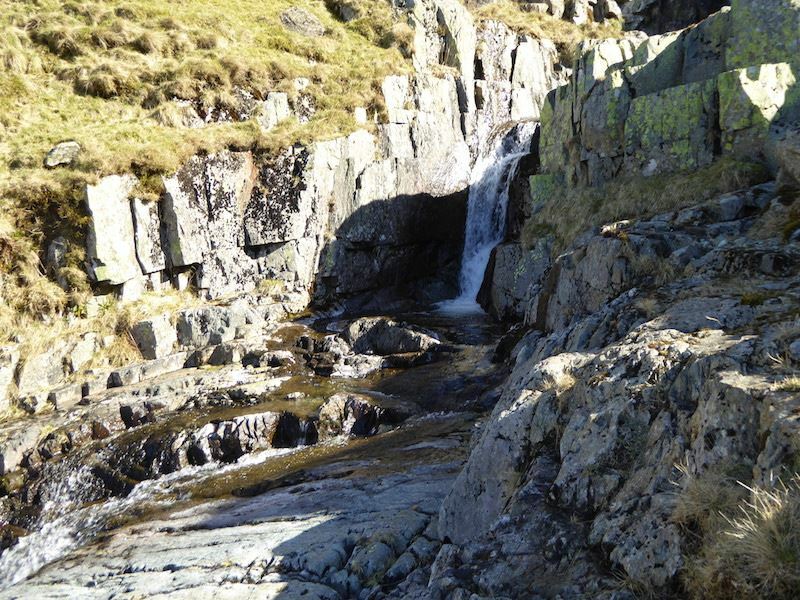 We had a short drinks stop when we reached it and then continued on the good pitched path. Its quite steep but there’s nothing difficult about it. 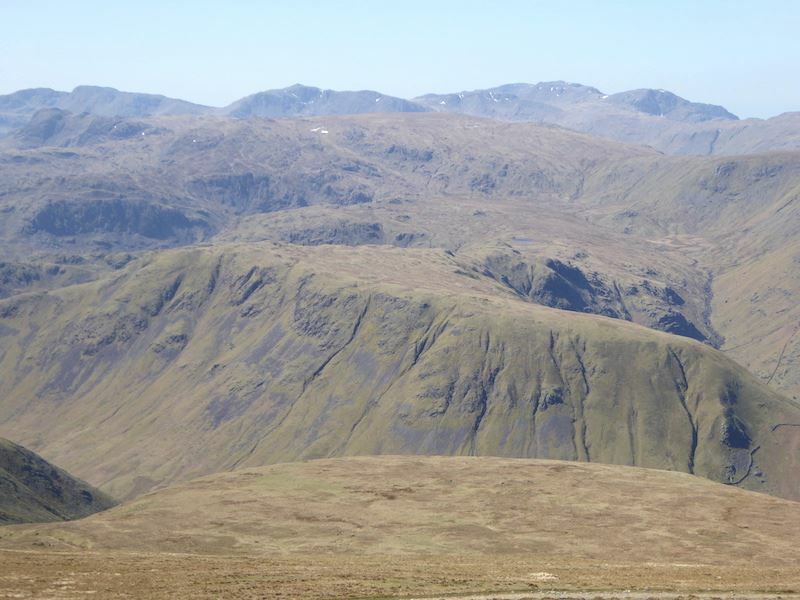 The distant fells begin to appear as we climb higher up the slopes of Dollywaggon Pike. 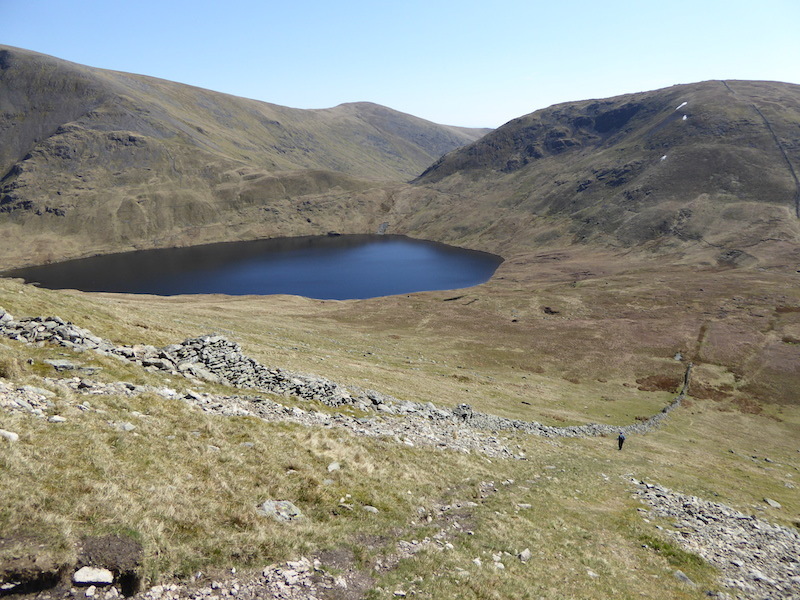 A look back down at Grisedale Tarn sparkling in the bright morning sunshine. 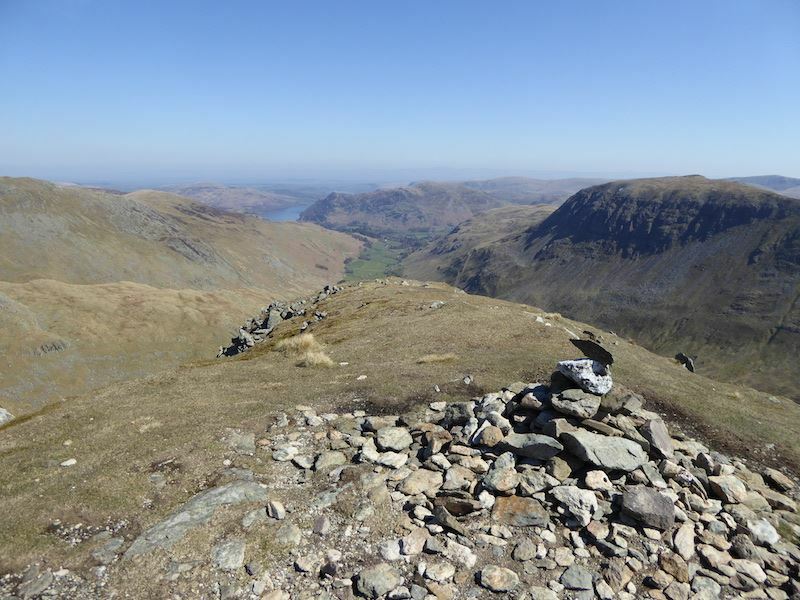 Up on Dollywagon Pike there’s a good view down into Grisedale, with a bit of Ullswater showing at the end of it. 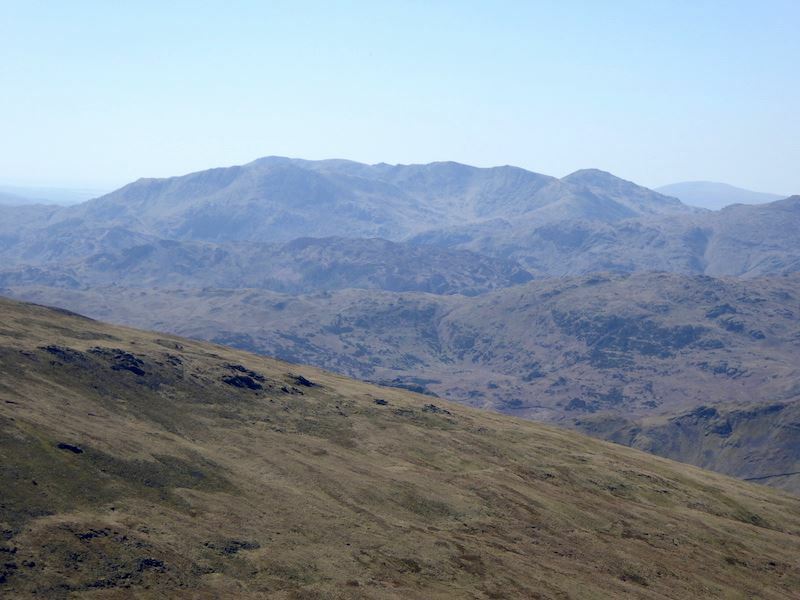 A close up of the Coniston Fells over in the distance. 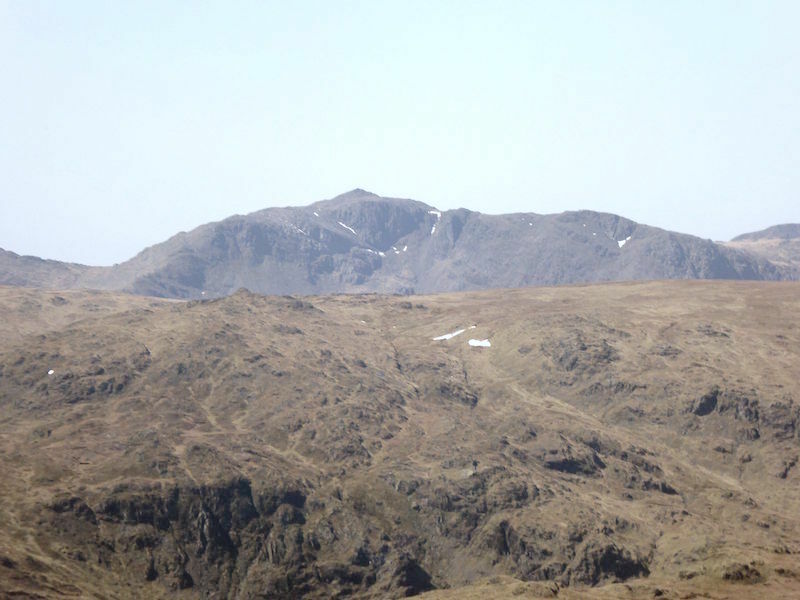 A close up of Bowfell with a necklace of snow patches. 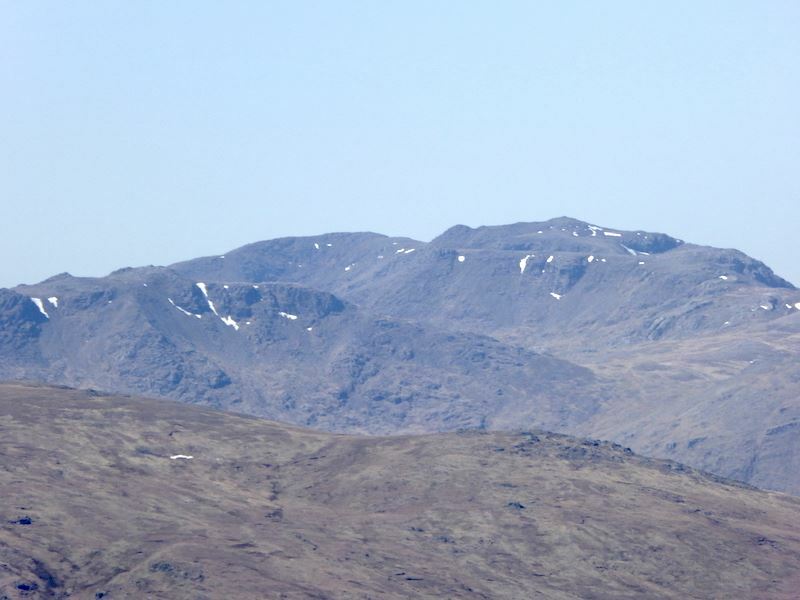 On the right of the skyline is Scafell Pike. 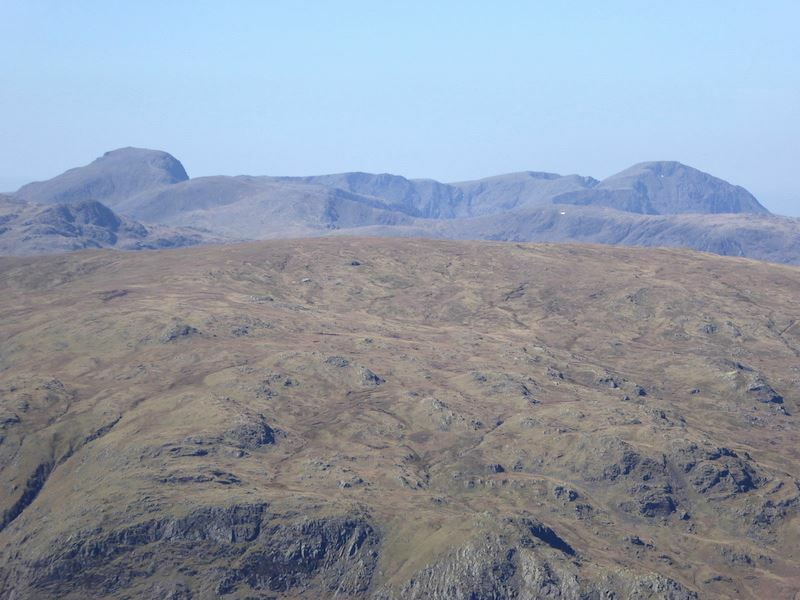 On the left is Great Gable with Pillar on the extreme right. 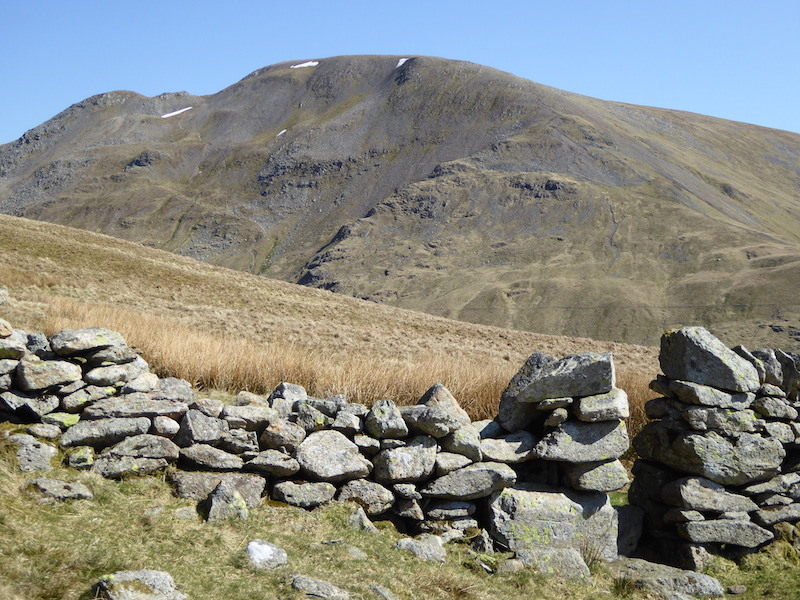 Steel Fell, the one with all the grooves down its side, in the middle foreground. 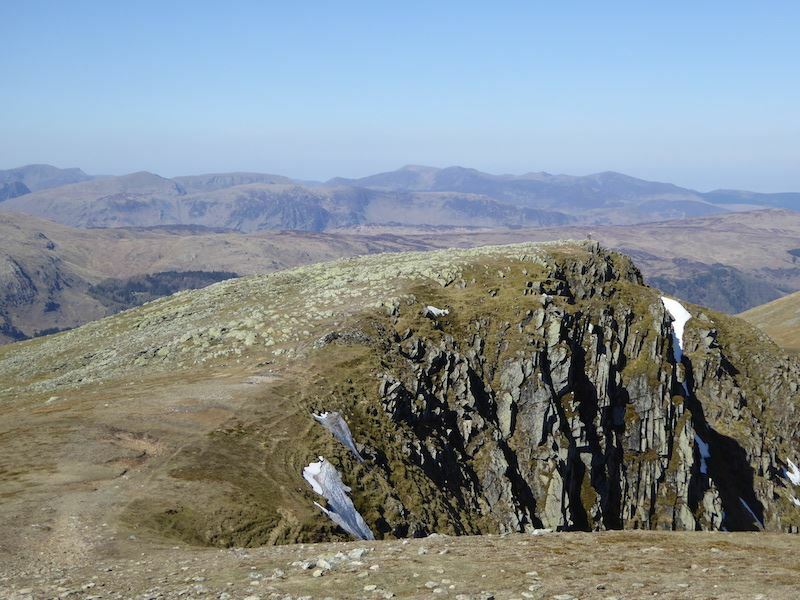 From Dollywaggon summit a look across to Nethermost Pike and Helvellyn. 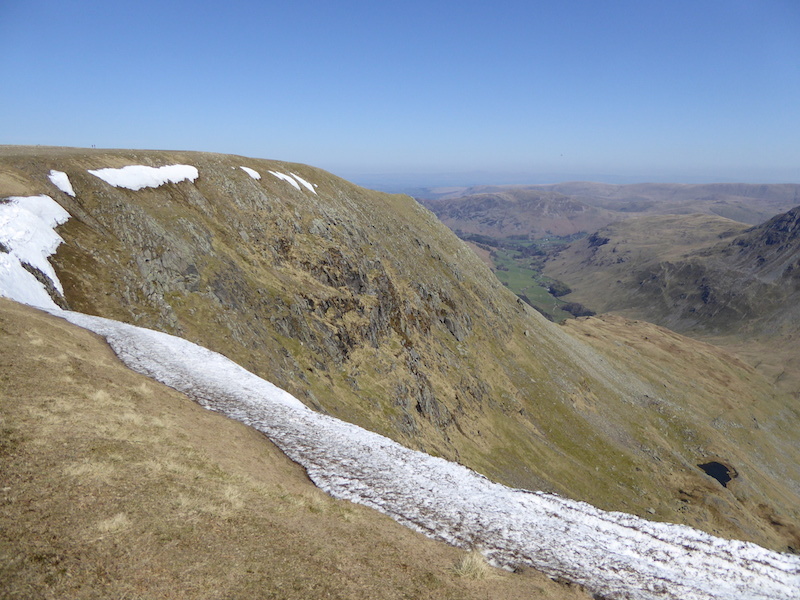 Patches of snow still clinging on to both of them. 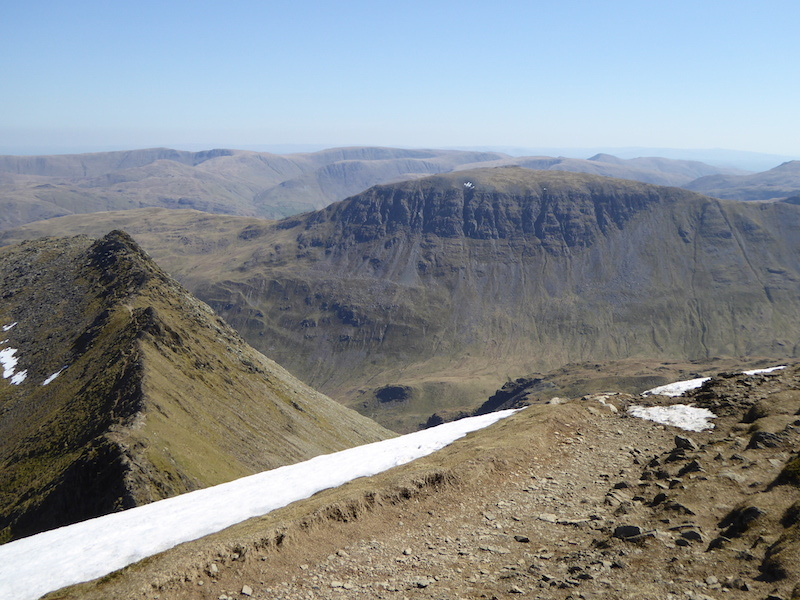 A closer view over towards Helvellyn with the pointed peak of Catstycam on the right of it. 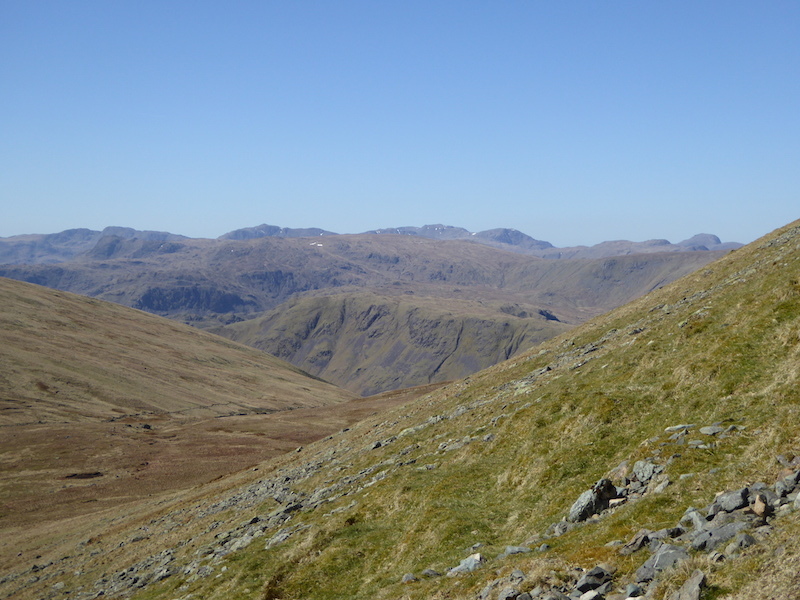 Fells in all directions as we leave Dollywaggon Pike. 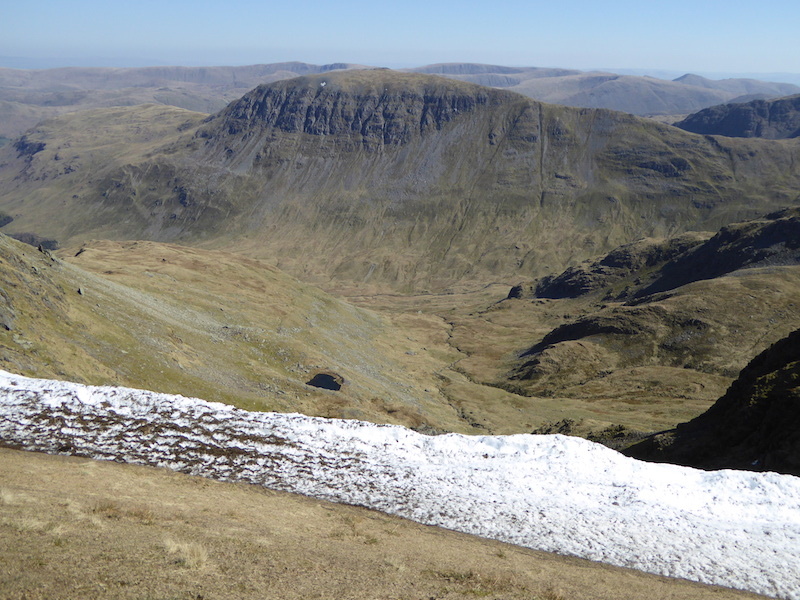 On the path to High Crag, patches of snow still on that too. 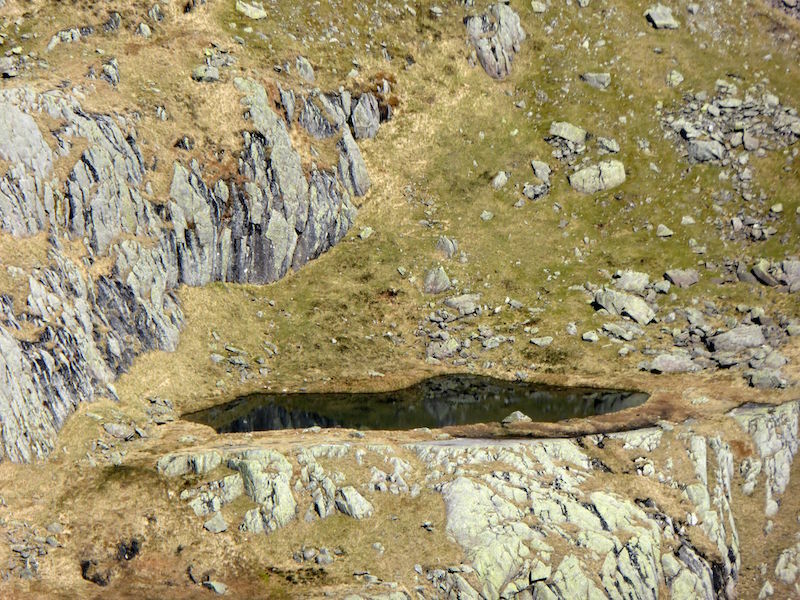 A close up of Hard Tarn which nestles on a shelf just below Nethermost Pike. This is on the ‘to do’ list possibly on a dry sunny day like today when all the snow has gone. 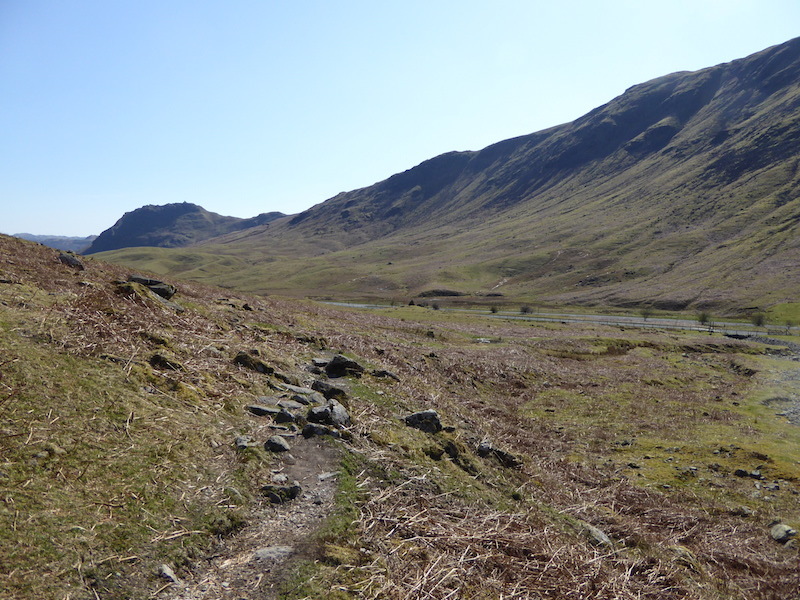 That’s the path to Nethermost Pike on the right hand side, when we got there I forgot to take any photos, what a dummy. 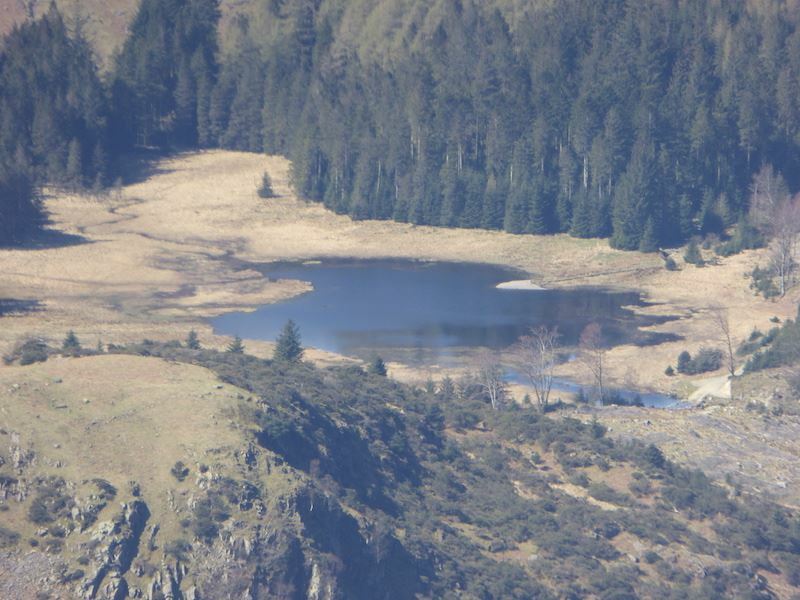 Perhaps I was too busy concentrating on this very long zoom over to the west to get a close up of Harrop Tarn. 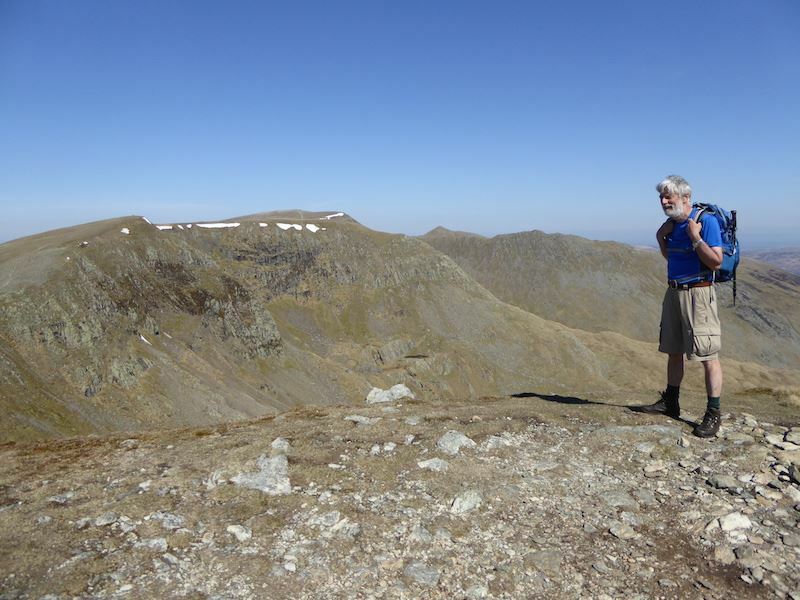 On the way to Helvellyn and keeping well back from the cornice to get a shot of Striding Edge. 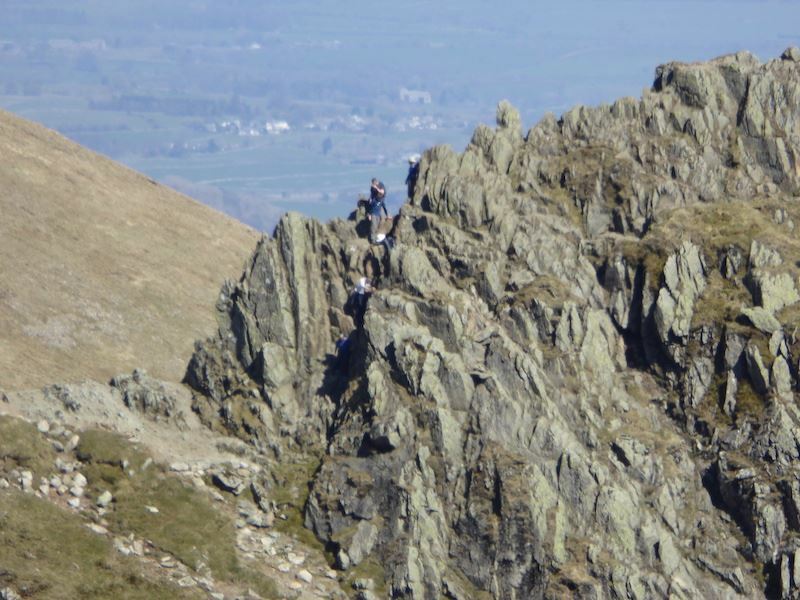 Another big zoom to have a look at the walkers on Striding Edge. 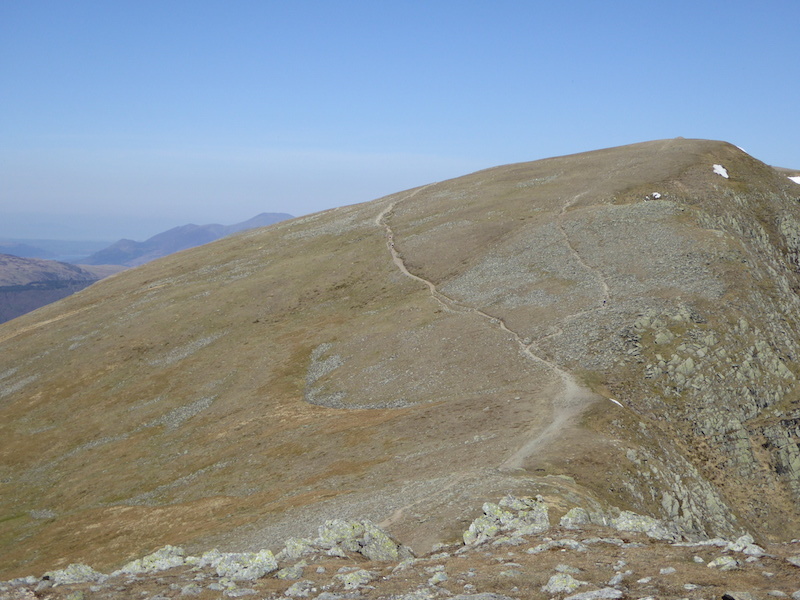 For many walkers this will be the route off Helvellyn, Its Swirral Edge and the path leads on to Catstycam, although you never see many people carrying on up to it. 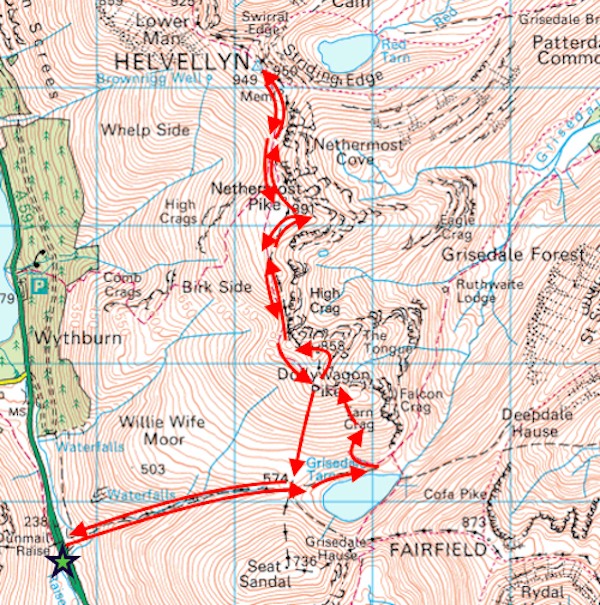 They seem mostly to branch off to the right and head back down to Glenridding. 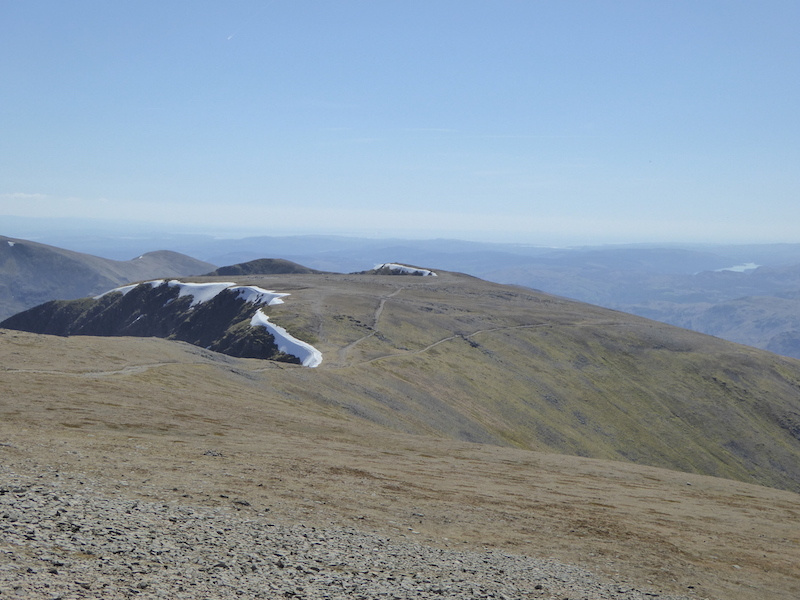 It was like being on the promenade at Blackpool on Helvellyn today, there were people everywhere. 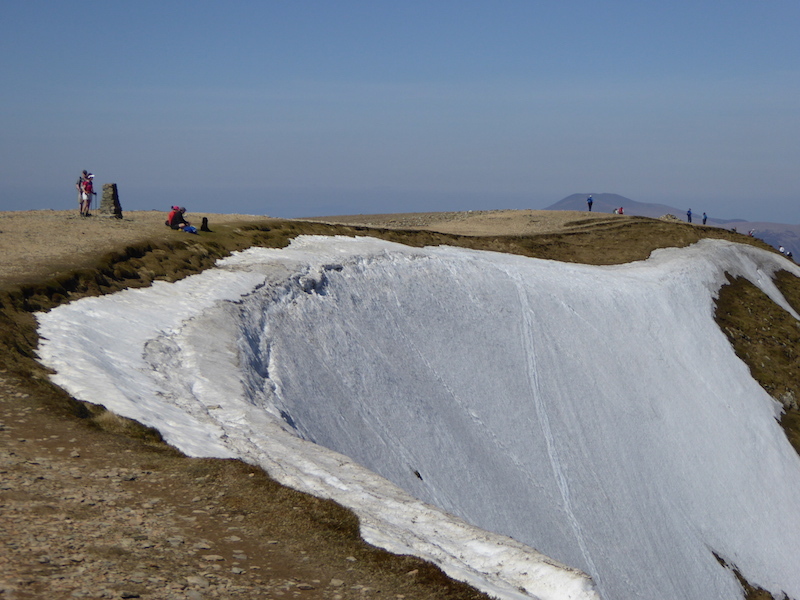 Everyone kept well away from that particular cornice though, its a very long way down to the bottom. The groove going downwards through the snow is the track left by someone who decided to ski down there earlier in the winter, that’s pushing one’s luck a bit too far I think, avalanches aren’t only confined to the Alps. 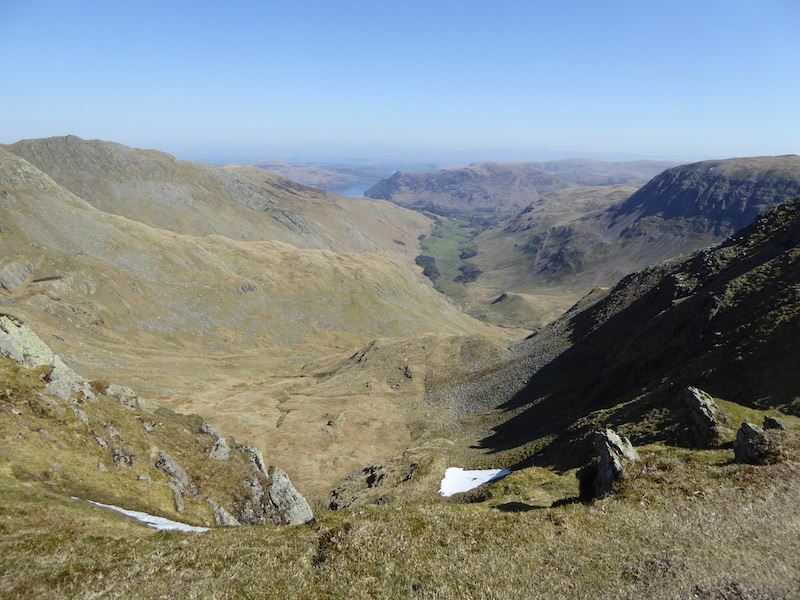 A look back at Nethermost Pike and Dollywaggon Pike, with Coniston Water over on the right. 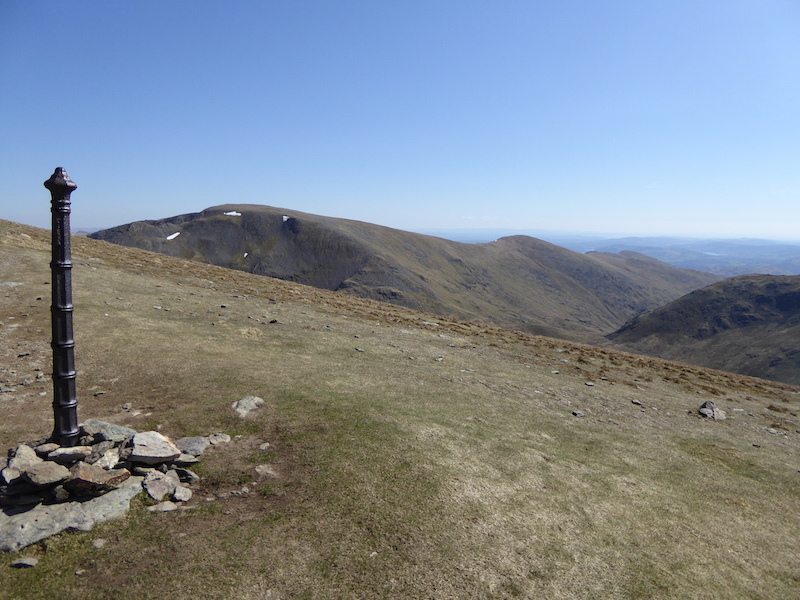 Helvellyn plateau and trig point with Raise over to the right of it. It was just lovely up here today but a bit too hazy for long distance views though. I had to wait my turn for a good while here as there were so many people around. 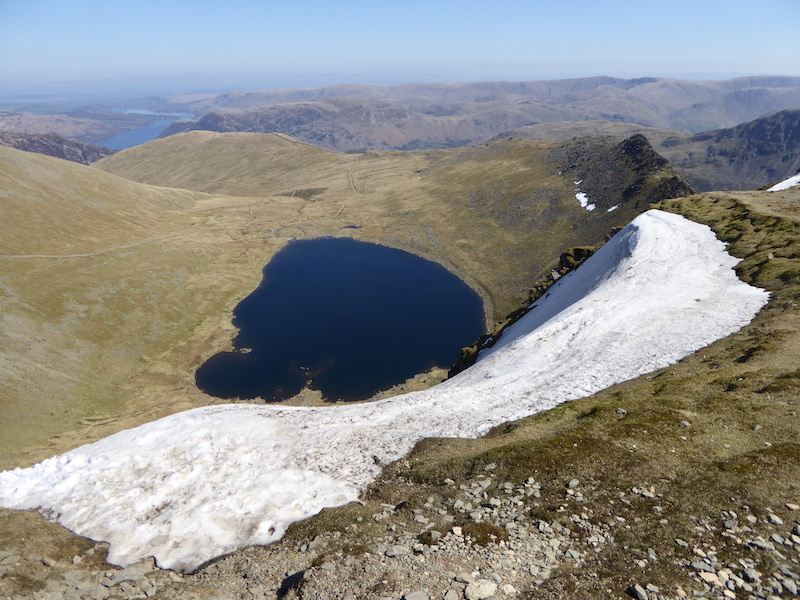 Looking down at Red Tarn and keeping well back from the cornice. 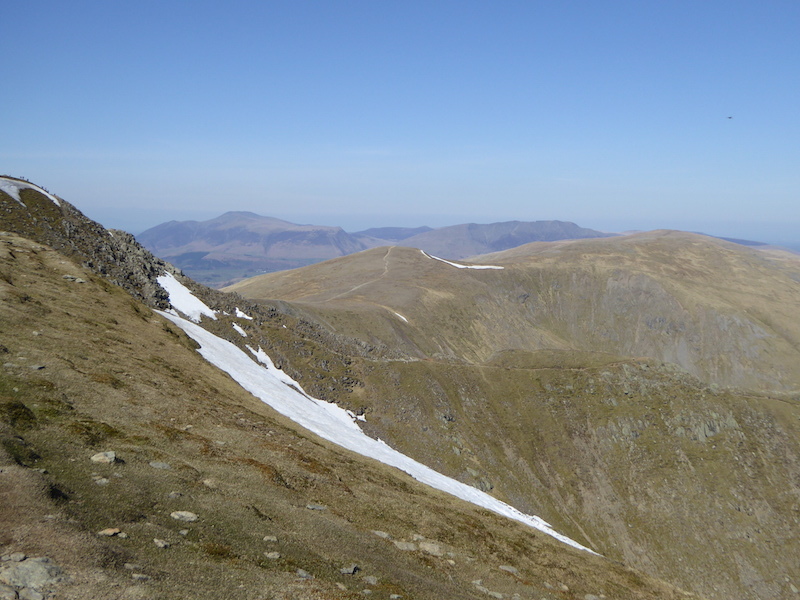 Over on the skyline you can see Skiddaw to the left and Blencathra to its right. The Gough Memorial, erected in memory of Charles Gough, a Manchester artist, who fell to his death in April 1805. 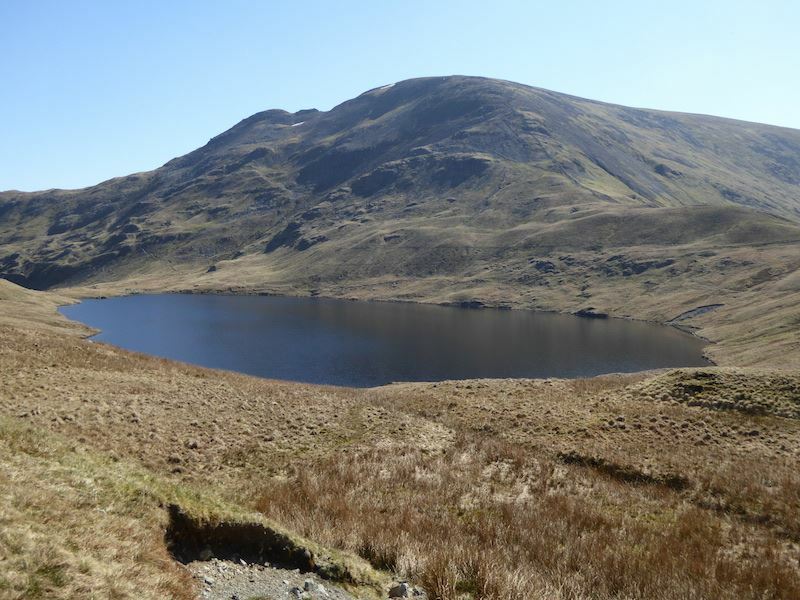 On 27th July a shepherd came across a little dog barking near Red Tarn. Beside the dog he found Gough’s skeletal remains and his belongings. The Romantic poets and artist of the time glorified the fidelity of the dog, while ignoring Gough’s lack of caution in making the attempt without a guide or any local knowledge. What the dog ate during the three months vigil beside its owner I’ll leave to your imagination. 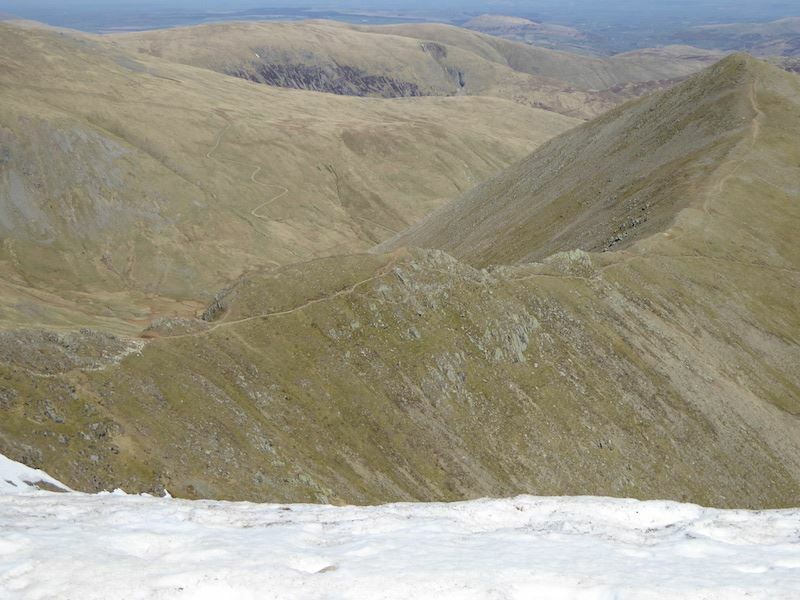 Looking down at Striding Edge and across to Saint Sunday Crag and the Far Eastern Fells. 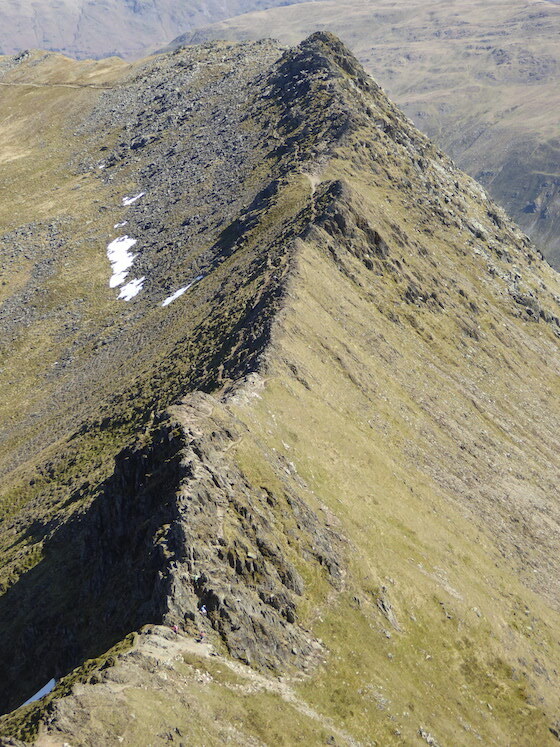 The ever popular, though not with me, Striding Edge. Walking on the top of a capital letter A is not what I regard as enjoyable. Neither can I cope with that degree of exposure so the charms of the Edge will remain forever unknown to me. I’d much rather look at the scenery which is pretty impressive, even though the winter and the sun have bleached a lot of the colour from it. 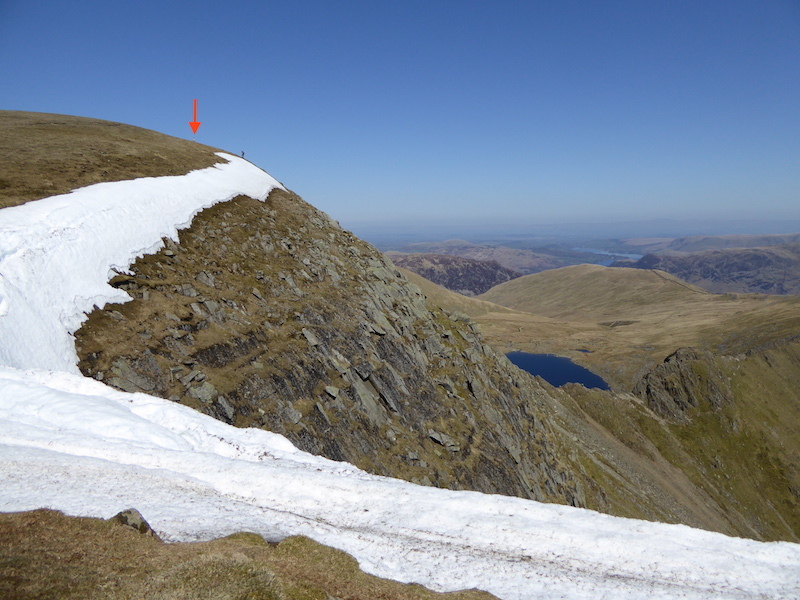 The walker near the snow line and the one above him on the grass (below the arrow) have made it over Striding Edge. The one in front climbed out on his hands and knees and scrambled hastily for the safety of the grass without any look back. The one near the snow simply walked out and then turned and stood calmly taking photos. 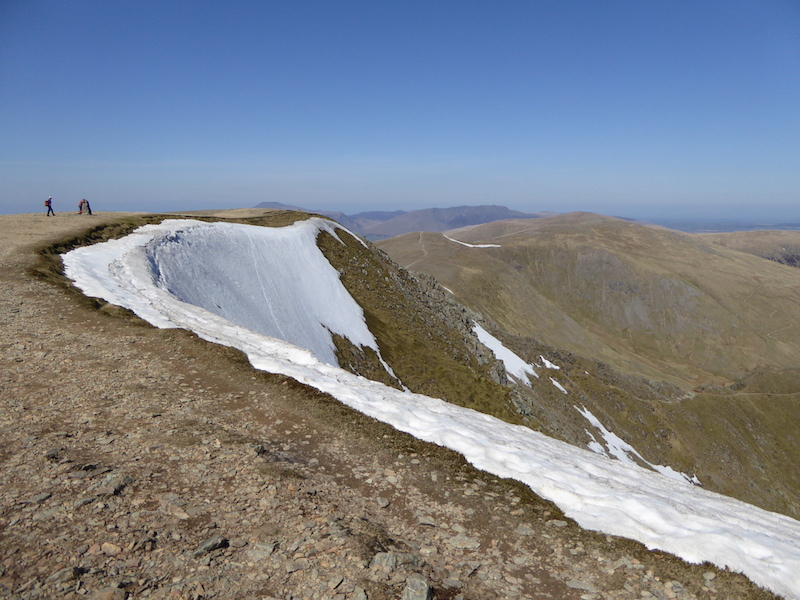 These three still have a long way to go before they’re on Helvellyn summit. 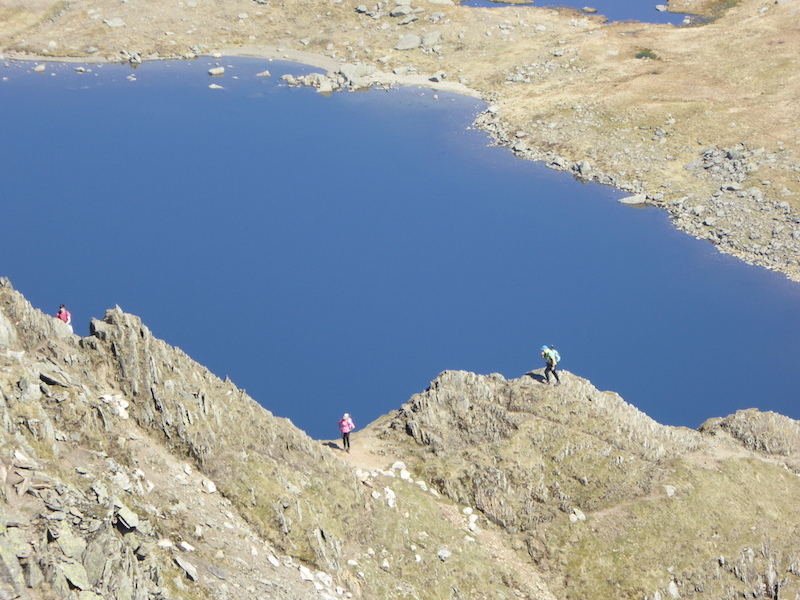 A blue Red Tarn helps with some contrast. 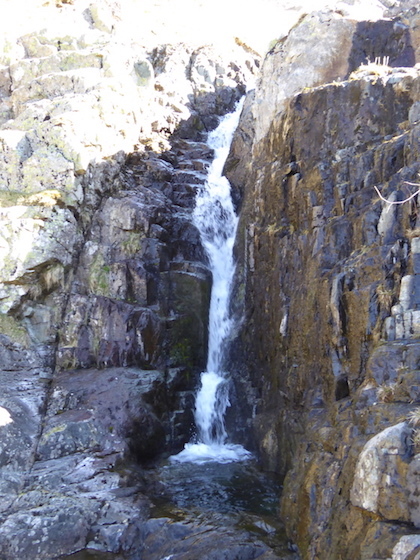 This is just a part of what they have all just clambered over. 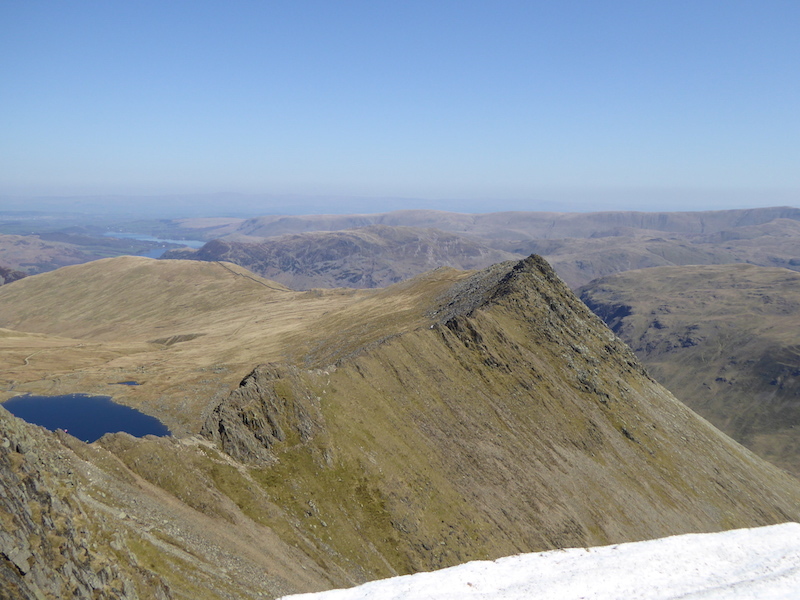 Another view of Hard Tarn on the slopes of Nethermost Pike, with Saint Sunday Crag adding some scale. 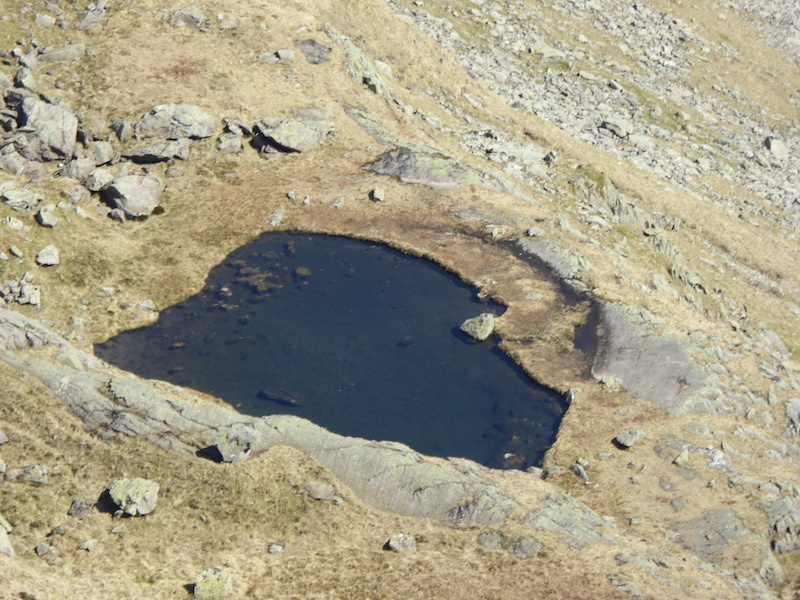 A close up of Hard Tarn. 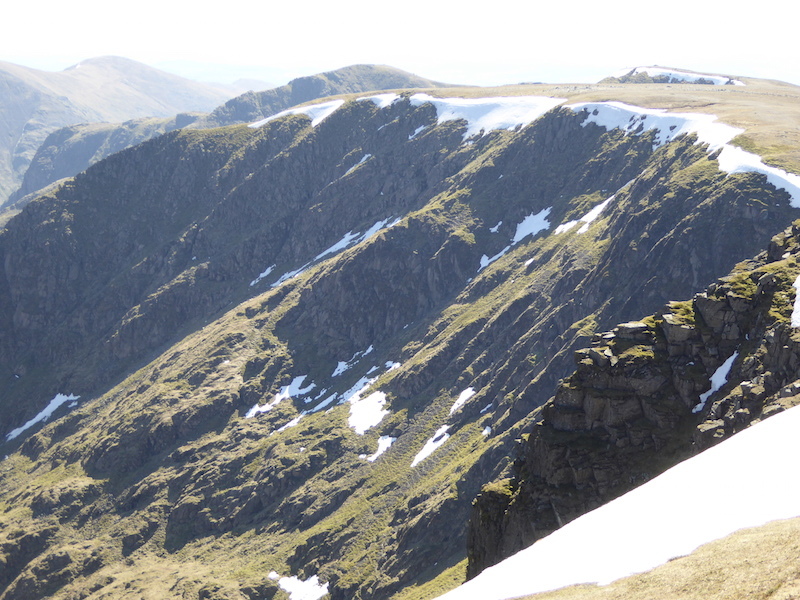 A look back at Nethermost Pike. 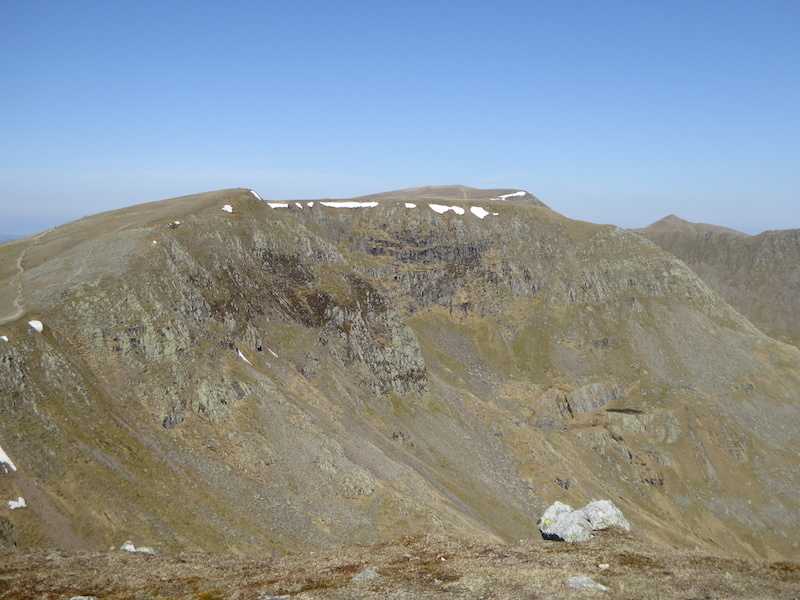 It was about here when I realised that I hadn’t taken any photos at the summit, either going out or coming back so it was a case of a quick turn round to take a long view of it. 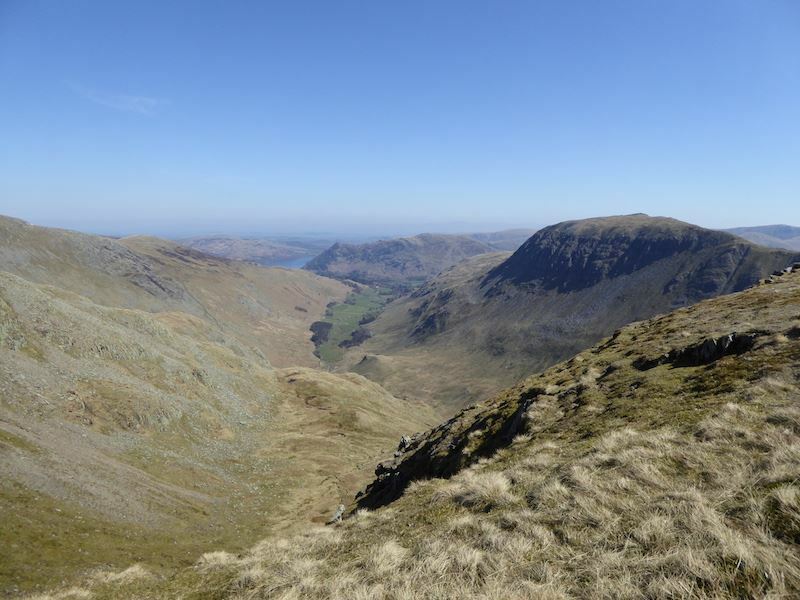 Across is Fairfield sloping down to Great Rigg, which in turn slopes down to Stone Arthur. 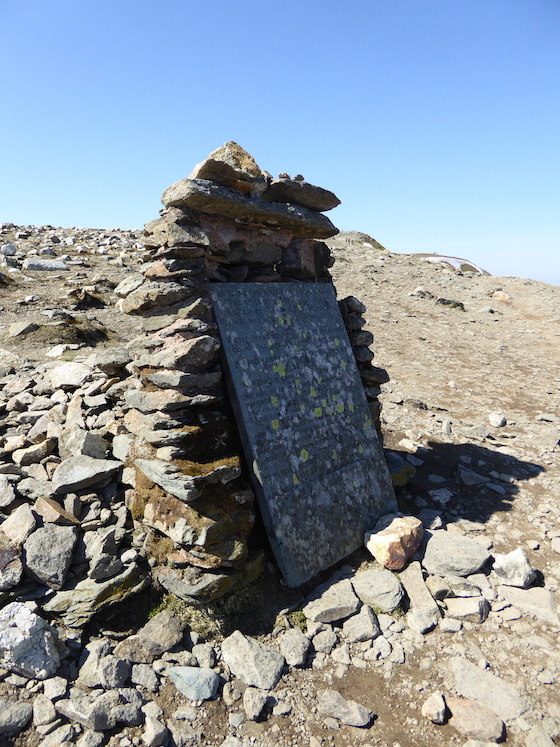 This post is a useful marker when the cloud is down, it marks the start of a path down to the right of the photo. 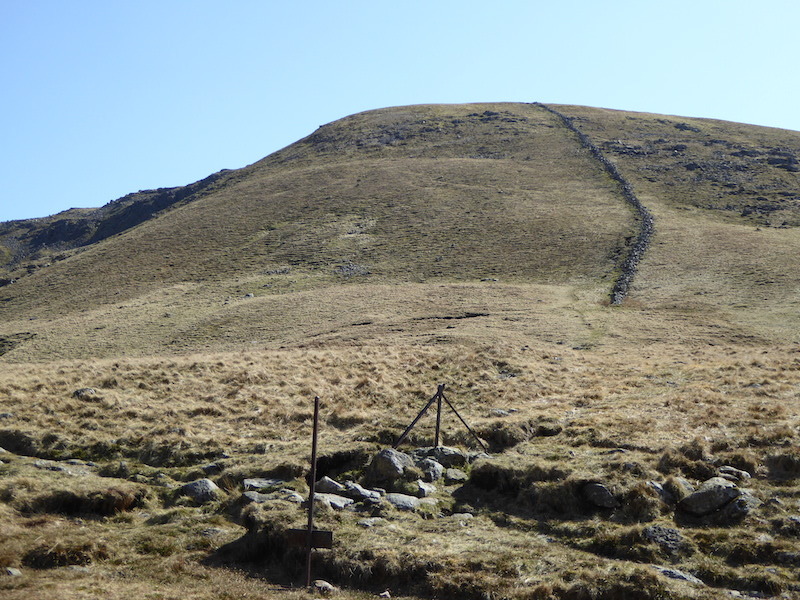 This is the path marked by the post in the previous photo, it provides a safe way down in bad weather. It is very steep though and I’d much rather go down it than up it. 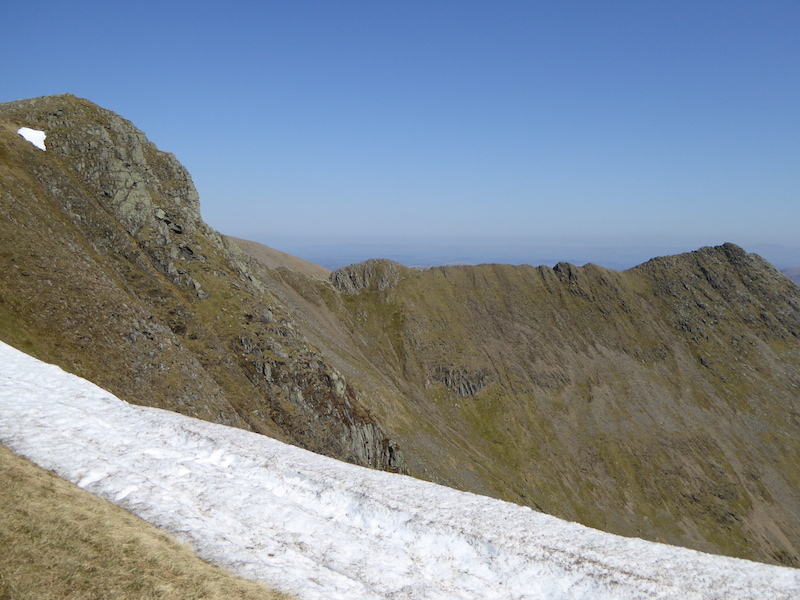 The craggy face of Fairfield over to our left as we descend. 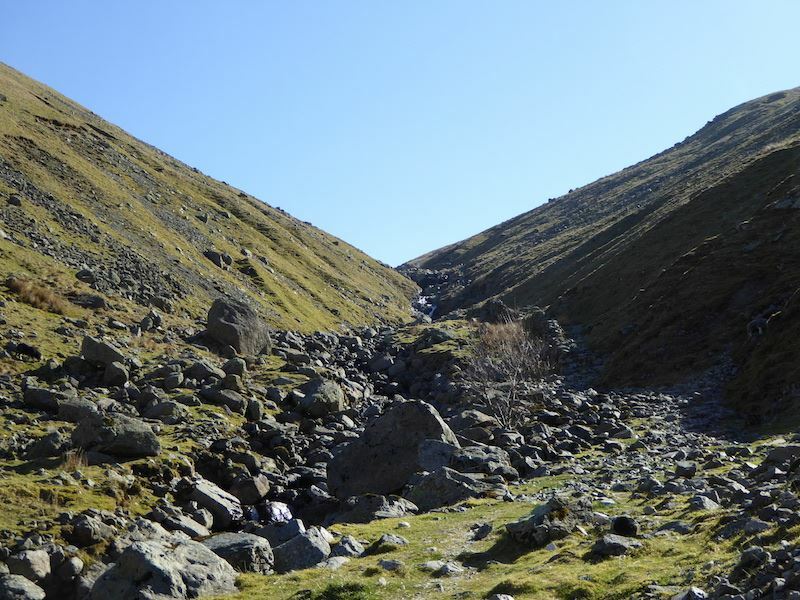 Looking up at the path up Seat Sandal from the junction of paths at the bottom of Dollywaggon Pike. I know it doesn’t look it but that’s quite a steep pull up too. 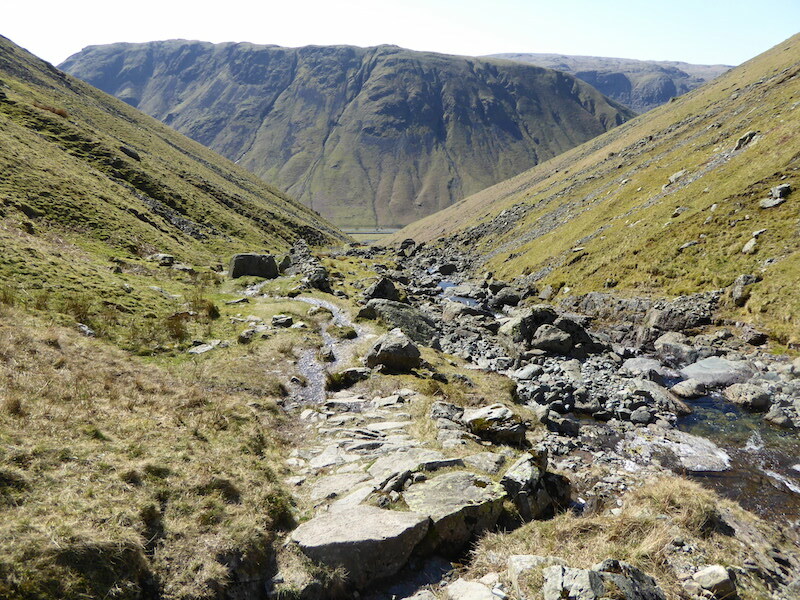 Returning down Raise Beck with a view of Steel Fell across Dunmail Raise. 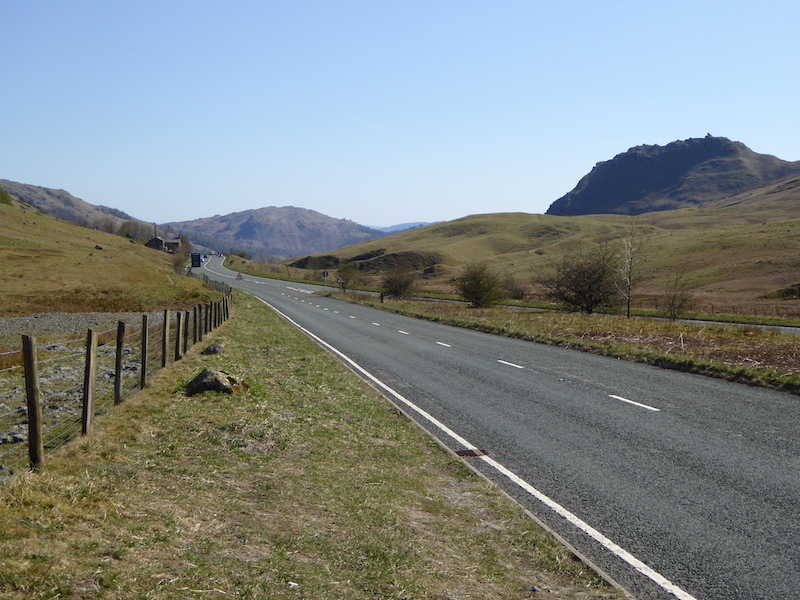 So here we are, back down to the road with a view of Helm Crag all the way to the lay-by. Back to civilisation and a short walk back to the car accompanied by the constant roar of traffic, oh well, we’ve had six hours of peace and quiet so we shouldn’t grumble.